We had some very pretty and colorful projects last week! Check out the Purrfectly cute Kitty Cat Key Chain! I love the WIP in the photo too – one day I must try my hand at making one of the mochila bags! 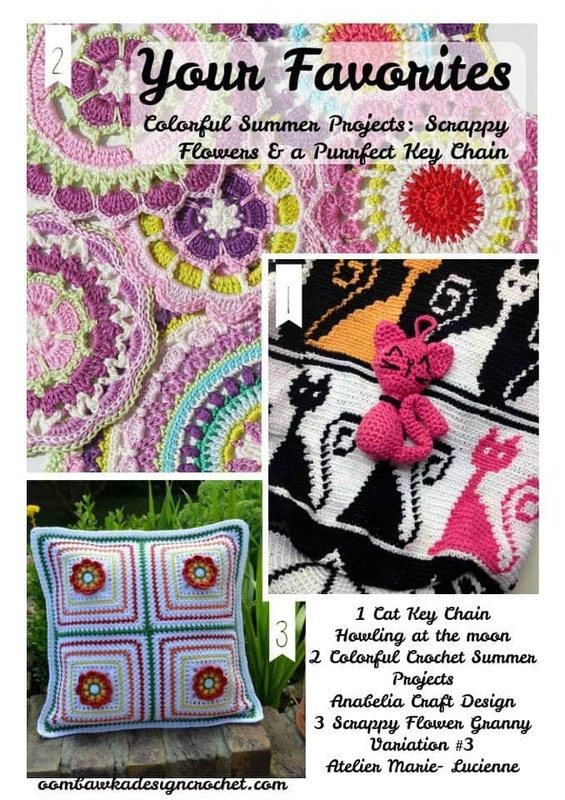 The Scrappy Flower Granny Pillows are fantastic – and a free pattern is included for the squares! The mandalas – just make me feel happy – bright and colorful – the perfect summer projects. Here are your featured favourites from last week’s Link and Share Wednesday – Link Party 154 as chosen by you! . If anyone knows how to find the actual pattern for number one, the cat key chain, please share that with me; thx! I love these links but I could not find patterns for one and two. Was very interested in the mandala patterns but she indicated she had not written them up. Maybe I am wrong? Thank you so much for featuring me again, Rhondda!! I really appreciate it!